First Nations dance is more than a colourful spectacle of music and movement; it’s a reflection of the values and traditions of a people. Their dance practice is a ritual involving visual arts, song, intergenerational exchange, storytelling and movement, and the Coastal First Nations Dance Festival, held each March, offers the public an introduction to these cultural offerings. Indian Act, there was still a lot of work to be done to revive artistic traditions and ensure the dances were not lost. 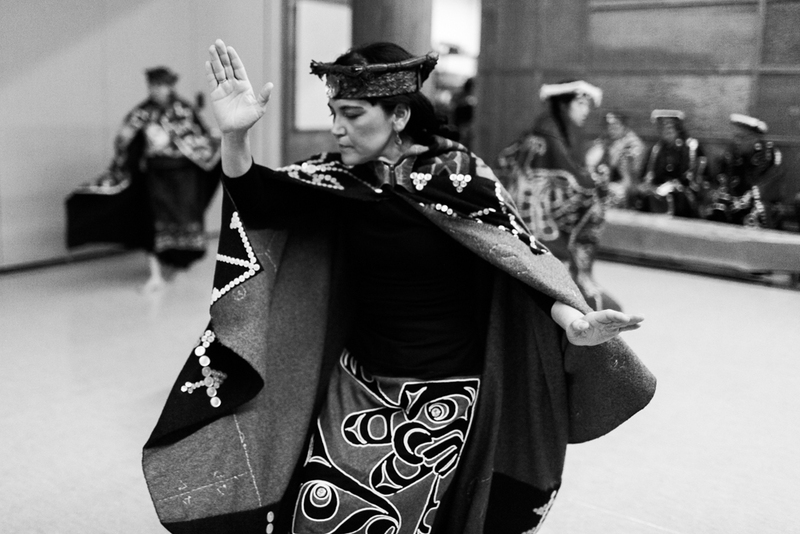 It has been presented since 2008 in Vancouver by Dancers of Damelahamid, whose artistic director, Margaret Grenier, saw the importance of this type of gathering for the presentation and preservation of First Nations dance firsthand. Haw yahawni nah was founded by her parents, whose legacy she continues with the festival’s school programs, afternoon showcases and evening performances. The Grand Hall of the University of British Columbia’s Museum of Anthropology, surrounded by imposing totem poles and coastal First Nations art and artifacts, is the perfect venue. Fifteen dance groups, representing nations from coastal B.C., Alberta, Ontario, Yukon and Washington State, performed at the 2016 festival. TeshaEmarthle, a competition smoke dancer from Ohsweken, Ontario, and a member of the Tuscarora Turtle Clan of Six Nations, was one of the headliners. Emarthle showed off the rapid-fire footwork and deep concentration of her smoke dance, followed by her partner, Jordan Smith from the Mohawk Bear Clan of Six Nations, who performed a fast-paced, grounded war dance. Not only are song and dance inextricable in First Nations cultures, but the stories that accompany the dances are also inseparable. In one introduction, Smith likened their Old Moccasin Dance to the Charleston, joking that a man named Arthur Murray must have visited the First Nations and stolen their moves, because the Charleston shares the same fast switching of feet and swiveling of ankles. Another highlight was a preview of two excerpts from the full-length work by Dancers of Damelahamid, Flicker, titled after a woodpecker from the northwest coast of B.C. The contrast between traditional and contemporary dance was on display in a group section featuring long-beaked wooden masks with movable parts and full button blanket regalia, and a solo that focused on contemporary interpretations of the bird’s movement. Here, the dancer wore a simple pink silk dress, using handheld fans to represent the bird’s wings and accenting the sharp, flicking movements of the wrist. Both interpretations embodied the playful, curious nature of the animal. Many of the coastal groups of B.C. showcased impressive wooden masks, with some performers playfully coming into the audience. The Haida group, Rainbow Creek Dancers, used masks in most of their dances after a powerful drum-heavy entrance down the main hallway of the museum. Their frog masks had moving tongues, their raven masks had beaks that snapped open and shut quickly — making it easy for one dancer to swiftly take an audience member’s hat — and their salmon dance featured a giant wooden salmon head bobbing above a billowing sheet. Similarly, the Squamish Nation’s wolf dance featured a large, realistic mask for a commanding solo, and the Tlingit group Dakhka Khwaan featured a masked duet with a raven trying to impress a wolf lady with huge eyelashes. The larger-than-life masks amplify the performances and challenge the dancers to maintain their animal character, often while manipulating the mask’s moving parts. The most impressive mask belonged to Git-Hoan, a Tsimshian, Tlingit and Haida group, whose large eagle masks split open to reveal human faces. Also impressive were the different types of regalia worn by each group, representing their unique identity. The dancers make their own outfits and accessories, which is an integral part of their practice — another skill passed down through the generations. Many of the coastal groups wear red and black button blankets adorned with animal outlines. Emarthle and Smith, representing the Eastern Woodland aesthetic from Ontario, wore floral prints, fringed leather, bright moccasins and beautiful feathered headpieces. When I spoke with Grenier after the festival, she explained that her group doesn’t own the traditional dances they perform; instead they are taking care of them, preserving them and keeping them alive for the next generation. These generations were present on the stage, from grandparents to small children, all participating in shared cultural rituals and combining visual arts, music, dance and storytelling to create multifaceted performances that are beautiful on the surface while also rich with history and meaning.